RonRon is a Brazilian company that’s redefining style for the modern cat. 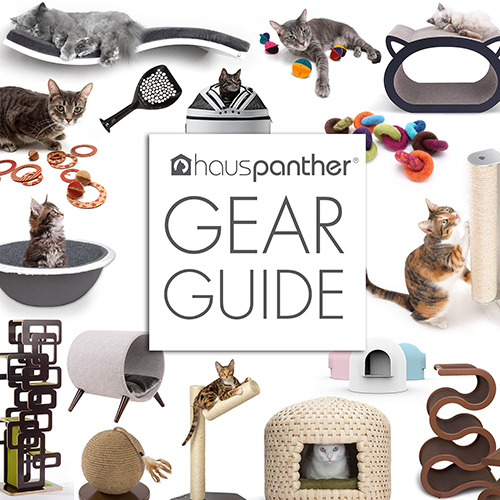 Check out this huge collection of modern cat furniture including beds, hideaways, scratchers, cat trees, and wall climbing systems. There are several styles of perches and hideaways to choose from, many that serve double duty as scratchers. All have replaceable carpet to extend the life of these beautiful pieces. The collection includes a number of modern cat trees that can be reconfigured to create a customized design for your cat. Most are available in a variety of finishes and carpet colors. And finally, RonRon offers a wide range of wall climbing products including stairs, ramps, hideaways, perches and corner units. Visit ronron.com.br to see the whole line and to get pricing. The site is in Portuguese, so you may need to use a translation program to get the details. Buy 2 Get 1 FREE Sale on Hauspanther ModKickers & ModShakers! Nice to see this gorgeous furniture and especially nice to see all those beauitful models, especially the house panthers! Thank you for sharing with us. These RonRon designs really speak to me. Even though I have an old home (113 years old), I’d still love to put one of these beauties in it for my cats. Thanks. Oh yeah! I like what I see here. If those trees really approached your cats, I’d run screaming in the opposite direction and take your cats with you. Ha Ha Ha Ha Ha! Rofl! I hail from Brazil, and find it splendid that there are such amazing cat designs starting to be made there. Whenever I visit my family again I will try and buy something (anything that may fit in my luggage, really) from them. Really cool stuff for our 5 condo cats. Prices in US dollars would be very helpful.